Totally worth 200 pieces various and great quality stickers. Question: Are the stickers in the pictures the ones you actually get? Question: Are these easy to peel off, like if I decide to take one of them off my MacBook, would it leave residue or tear when peeling off? Answer: Yes, they are Vinyl therefore are waterproof. （200 Pack NO-duplicate Stickers ）GET MOST WHAT YOU SEE AT PICTURE Size of the stickers: 6-10cm; Material: PVC, all stickers are different at one series and every series's stickers is ALSO different too.Just choose what you like!!! 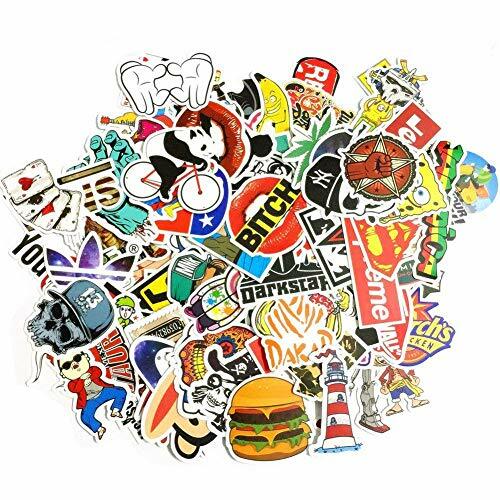 AWESOME ASSORTMENT GRAFFITI STICKERS : Great Gift for Children, Kids, Youth, friends, family and other DIY decoration lovers. Totally worth get one for adding fun in your life. SKATEBOARD STICKERS: As necessary beautiful accessory to DIY decoration.Can be used on your Car Motorcycle, Bicycle,Snowboard ,Computer, Laptop, Macbook, Luggage,Bumper,Travel Case, PS4 ,XBOX, ONE Nintendo Switch ,iPhone and so on. HIGH QUANTITY: Fashional CAR Stickers Pack with Sun Protection and Waterproof Function. No need to worry that the stickers will fade out under Sun or Water. STICK AND REMOVEABLE: Just get your Stickers, Clean the surface, Sticker on,then Use your imagination to create works now. Do not leave any marks, residue or stickiness if removed. If you have any questions about this product by GoodYH, contact us by completing and submitting the form below. If you are looking for a specif part number, please include it with your message.